Viewing what's on the screen of another computer—or even controlling that other computer remotely—can be super-handy, for troubleshooting, looking up documents, or running a program you can't run locally. As with file-sharing, remotely accessing a Mac from another Mac is relatively straightforward. The tools are built into OS X; you turn on screen-sharing in the Sharing preference pane. But setting up screen-sharing between a Mac and Windows PC takes a bit more work, and requires installing some third-party software. The biggest problem: Macs can't share screens with PCs running Windows 7 Home Premium edition. To connect from a PC to a Mac, you’ll need to install a VNC client in Windows. There are a number of free clients you can choose from, including TightVNC. After you’ve downloaded and installed a VNC client on your PC, go back to your Mac and open System Preferences. Choose Sharing, and select the Screen Sharing checkbox. Screen-sharing is now enabled for remote users signing in with the Mac’s administrator name and password. To enable others to share the Mac’s screen, make sure Screen Sharing is still selected and click Computer Settings. Select Anyone May Request Permission To Control Screen and, if you wish, VNC Viewers May Control Screen With Password; if you select the latter, enter a password in the box. Finally, click OK.
Back in the Sharing pane, under Screen Sharing: On, you’ll see a note that displays an IP address in the form of vnc:// ipaddress Make a note of that address. 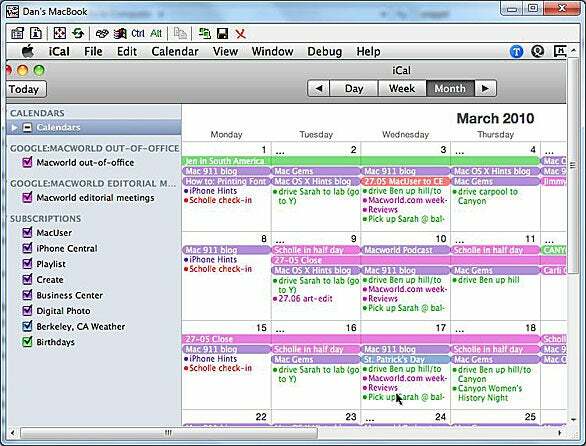 Once you install a VNC client on your Windows machine, you can run Mac apps like iCal remotely. Back on the PC, give your VNC client that address (but without the vnc:// in the front). If you have trouble connecting, check your client’s encoding settings: If they’re set to ZRLE, try switching to Hextile. In TightVNC, you’d do that by launching the VNC Viewer, clicking the Options button, and then selecting a different encoding setting from the Use Encoding drop-down menu. To remotely control a Windows machine, you first need to install Microsoft’s free Remote Desktop Connection Client for Mac on your Mac. Unfortunately, RDC doesn’t work with Windows 7 Home Premium edition; it works only with Windows 7 Professional, Ultimate, and Enterprise editions; if you want to share the screen of a PC running Home Premium, you’re out of luck. Once you've installed Remote Desktop Connection on your Mac, you just enter your PC's IP address to connect. If you’re logged in as the administrator, and you have a password, click the Apply button. If not, either click the Select Remote Users button to add new users or create new user accounts. Windows 7 Open the Control Panel (Category view) then System and Security. Under System, click the Allow Remote Access link. In the System Properties’ Remote tab, select Allow Connections from Computers Running Any Version of Remote Desktop. If you’re the administrator of the Windows system, click the Apply button. If not, click the Select Remote Users button to specify which users can log in to control the PC; you may want to create a new user account just for remote control.